Svetvinčenat, also known as Savičenta in local dialect (or in Italian: Sanvincenti), is one of the many highlights of interior Istria. 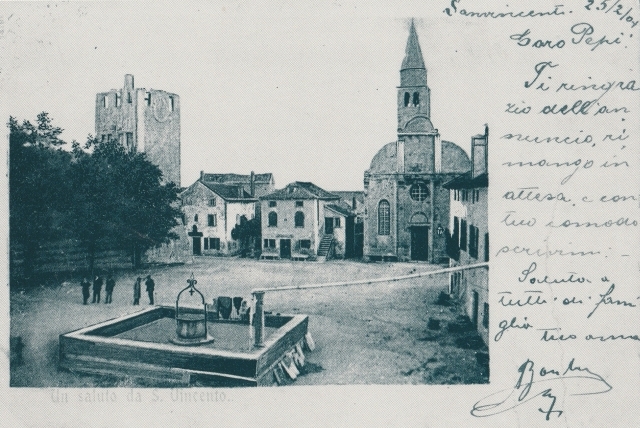 If you visit this charming town's square you'll see that it hasn't changed much from how it looked in this postcard from 1901. Dominating the square is the Renaissance-style church and Grimaldi castle, both built in the 13th century (the castle's towers were added later in the 16th century). There's also an enclosed well taking up a section of the square and in the south-western corner, a loggia. This atmospheric Renaissance piazza and the castle provide the backdrops for the annual medieval festival held here in the summer, and a contemporary dance festival every July. On a summer evening, Svetvinčenat is a great place to have a drink at one of the little cafes lining the road leading to the square, or a pizza on the terrace right on the square itself. The arched windows of its houses, crumbling facades and antique-style lanterns also add a touch of old world charm that make this little town one of my favourites in Istria.